Look no further. Heather Wass has been busy putting together Holiday themed bottles for her Etsy store, Custom Bottle Design. 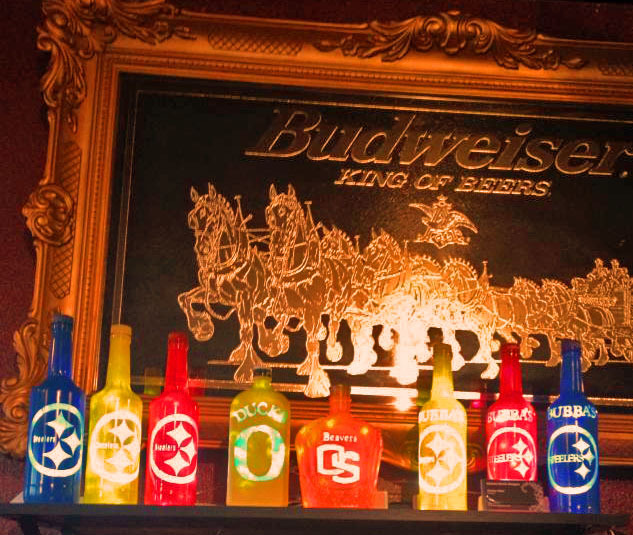 These bottle lights are all hand crafted and will add some Christmas cheer to any room in your house. I have to admit I am still pretty new to all of this. I made my first lamp as a Christmas decoration project for myself a year ago. My boss at the bar I work at liked it and asked if he could buy it. Then he put it in the bar as a christmas decoration last year and somehow they just took off! I now even have local businesses who have asked to sell them for me in their business. I have made and sold well over 200 in the last year, and now am experimenting with selling online. I have to admit I am clueless to all of this online stuff but I am learning! I haven’t had to advertise much at all, I post pics of them on my facebook page and other than that it has all been word of mouth and people seeing what I have already sold! BL – Is it hard to find time to work on your projects? Heather – YES! I have always been one who has to stay busy. So for many years I have always had 2-3 jobs at once. Because I have been fortunate enough to pretty much stay over loaded with orders, I spend just about every spare minute I have making them! I’ve made well over 200 in the last year! However, I am happy to say that just as of last Saturday I am now down to just one job! Well, one job (Costco) plus my bottle orders. It has been completely overwhelming trying to keep up with it all and be with my family too. So now I am able to work from home and be close to my family and still keep busy doing what I love! BL – Do you get any special requests? Heather – Yes I do. about 95% of the bottles I’ve made are requests. I let people tell me what they want… designs, colors etc. and I create their vision. On the rare occasion I have the extra time to just make something on my own, it usually sells as soon as I post it to facebook! I get sports themed orders the most, but the personalized ones are my favorite. Every one is made for each individual order, I also make my own stencils for each individual bottle, therefor every one is one of a kind! BL – Any words of advice for people just starting out? Heather – Don’t be afraid to be creative! I have never been “taught” anything. Everything I do I’ve learned by trial and error on my own. Sometimes I think some things would be much easier for me if I had some instruction along the way, but I also think that is what sets everyone’s art apart. I started with wood. I’ve made shelves, bookcases, wall hangings etc for my own home and believe me that wasn’t pretty in the begining! I bought wood and nails, and started pounding them together until I got it right! lol But now I have some really great pieces in my home that others have seen and paid me to make for them as well! I am now doing the same with my bottle lamps. Each piece I send out is a piece of me that then enters someone elses life, and to me that is pretty darn cool! I now have my work in 8 different states, and well as 4 in Pittsburgh… one on each of the Steelers coaches desks! We would like to thank Heather for taking the time to do this interview. The Holiday season can be pretty hectic and we appreciate her thoughtful responses. Be sure to leave a comment below about her crafting passion. Thank you. We enjoyed sharing your craft with others. I’ve been looking at the personalized name lamps on Etsy and I was wondering if Heather sent a picture of what it might look like before she actually made it. I’m assuming the font and picture would be what is shown but the length of the name can change everything. P.S. I just love the red Christmas bottle with the wording! The Twinkle Christmas bottle lamp is my favorite as well. Thanks for stopping by. Hi Vivian! Thank you! 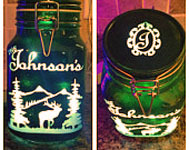 I make the stencils myself for each bottle individually. What I can do for you is email a picture of the graphics on the bottle before I paint it so you can see it and decide if you want to make any changes. I hope that helps! :) Please feel free to email me on etsy or directly at featherw75@yahoo.com. I would be happy to correspond with you as much as you need to get it right before I paint the final product!